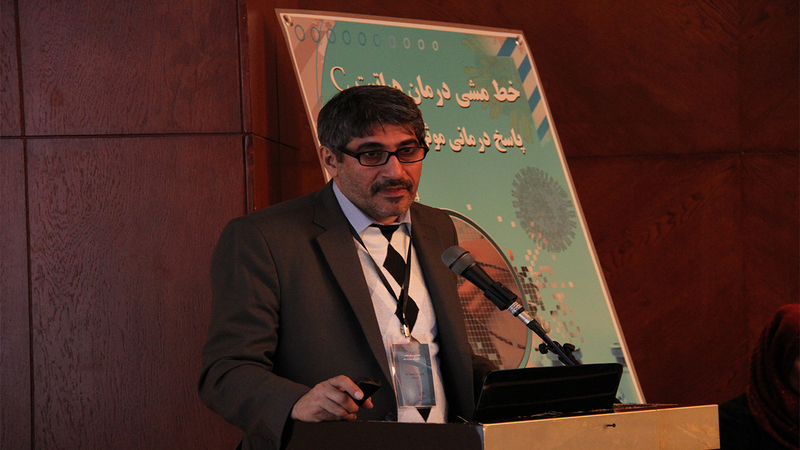 The Iranian scientific committee of Hepatits considered recent issues , held up a meeting on 23 Jan 2014. This meeting approximately 170 gastrointestinal diseases, specialist infectious diseases specialists and discussed and a group of clinicians and basic scientists working in the field of hepatitis C came together discuss the available methods ,and Adopted single instruction.The meeting also had some form of question and answer,after speech of outstanding professor and all professional presented their experience Professor Alavian scientific secretary of the Congress , he delivered the following speech on the subject Treatment of HCV infection in patient with hemophilia and thalassemia. کمیته علمی هپاتیت ایران با در نظر داشتن مسئله اخیر اقدام به تشکیل جلسه ای در تاریخ ۳ بهمن ۱۳۹۲ نمود. در این جلسه حدود ۱۷۰ فوق تخصص بیماریهای گوارش، متخصص بیماریهای عفونی و جمعی از پزشکان و متخصصین علوم پایه که در زمینه هپاتیت سی فعالیت می کنند گرد هم آمده و با بحث و بررسی روش های موجود، دستورالعمل واحدی را تصویب نمودند. در این جلسه علاوه بر سخنرانی تعدادی از اساتید برجسته، بخشی به صورت سوال و جواب برگزار شد و کلیه متخصصین تجربیات خود را عنوان کردند.